Reel Steal is an entertaining slot powered by Net Entertainment. This slot is a major throwback to the American cop shows which are very well-known in that decade. The slot is easily accessible to play on all Android devices, laptops, PCs, desktops, and tablet devices. The players have a chance of winning a big amount of as huge as 1500 times of their stake. Achieve Big Wins in Reel Steal! Reel Steal is constructed with five reels slot and nine fixed paylines. 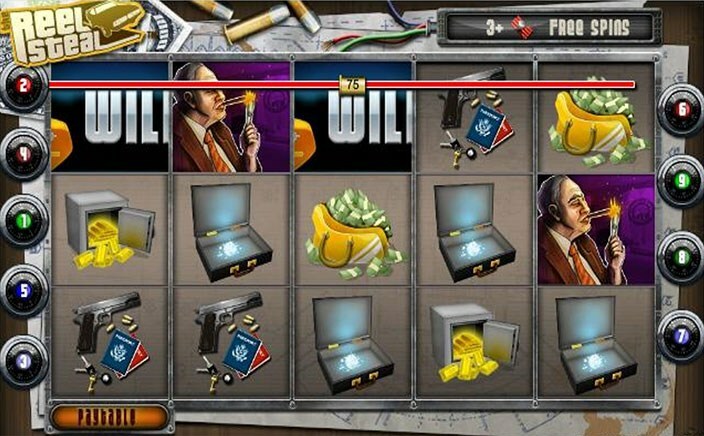 The main subject of this slot is criminals rather than the cops. The players can have a min bet value of £0.01 a spin to a max bet value of £45.00 a spin in this slot. All the symbols of the slot are related to the heist. So, there is a gun, a camera and the blueprints, a suitcase that contains a diamond, a bag that has banknotes and a safe full of gold bars. The Five dodgy-looking characters are valuable symbols of the slot and there is also an obligatory foxy chick present to add glamour to the game. A classic seventies car having yellow point job is the wild symbol of the slot and the scatter symbol is represented by various sticks of dynamite. In Reel Steal, the wilds are more valuable and during the base game, any of the winning paylines that contain the wild is worth a multiplier of 5x. In this feature, your win can get multiplied by up to 25x! By landing 3, 4, or 5 of the dynamite scatter reward the player with 15, 20 or 25 free-spins respectively. Any of the wins player land in the feature is subject to the multiplier of 5x but also including the wild in winning line makes it worth for a multiplier of 25x. Each time the player lands another scatter symbol in this round it adds to one more free-spin to the total. 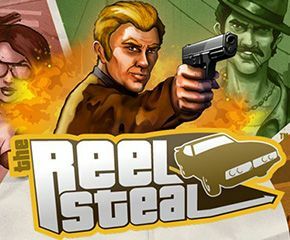 Reel Steal is a good slot to play with vivid graphics, pacifying animations and a brilliant music track. The free spins feature of the slot is an icing on the cake. The players can expect a nice Return To Player Percentage of 95.90% from this slot. Overall, the slot is worth your time.